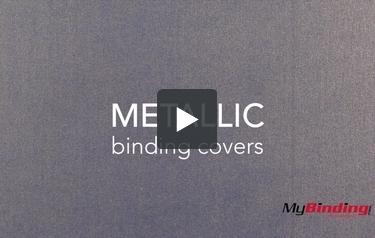 These metallics covers are some of the most glamorous and elegant papers that we carry. Available in more than thirty colors and in a huge number of sizes these covers are perfect for almost any report or proposal. Our metallic paper covers are heavy weight (86lb, 89lb, 92lb or 111lb) with a luxurious sparkling metallic finish on both sides of the paper. Check out our huge selection and consider setting your reports, presentations, projects and proposals apart. Plus every color is available in a variety of sizes, with or without punching and we can even add windows for you if you need them. Order yours today. 111lb shiny white cardstock with metallic sheen and texture. Available in 10 different sizes. Can be ordered unpunched or in 8 various punch styles with die-cut windows.